BeamMan's Water Effects really look wet! BeamMan’s Water Effect MMEs are pretty nifty, but they are not just for creating bodies of water. You can actually do a whole lot more with them than is immediately apparent! NOTE: Just tap on the photos to see them full size. This goes for the videos too. They look best full screen. Before anything else, you need to be aware of the following as certain things are necessary before the effect even works on your system, if at all. BeamMan has several versions of the water effect. Some of the earlier ones are now obsolete and may not even work on a modern computer. So make sure you get the latest version. Note also that there are dynamic and static versions of the effect. You want to get the dynamic version (usually this is the latest version of the effect). This tutorial assumes you’re using the dynamic version. You will need a pretty decent PC for the effect to work or work smoothly. It can be pretty resource intensive. Any little kid will tell you that puddles are fun! Guess what? So is the puddle included with the water effects. In some ways, it might actually be the most useful of the variants. The reason for this is that BeamMan’s water effects (except for the ones labelled “static”) are dynamic. Still ripples are darn useful as are the basic controls that allows the water effects to be blended into almost any scene. But there are some “rules” as nothing works like magic, so we’re going to use an actual set up to show you how it’s done. Then we load the puddle and size it to 5.0. Each effect has a recommended size, please refer to Reggie’s tutorial if you need more information on this. First and foremost; turn off the shadow display. The default MMD shadows do not look good with the water effects. You can use an external shadow effect if you wish like we’re doing in this tutorial. We will be using Excellent Shadow and d_Pmotskin on Miku. The water effects have a mirror like quality. They get their color by reflecting other models around them. This is important! You can already see this in the image above where Miku is reflected in the puddle. To give the puddle some color, you start by loading a sky-dome. 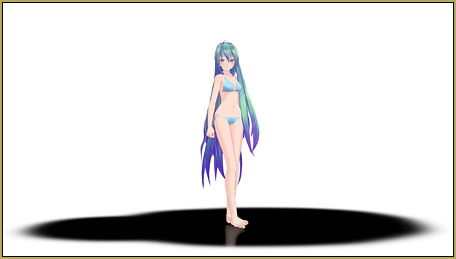 Next we add an actual stage, since Miku is in the mood to go to the beach, let’s just use the old Gull Town model. We’re going to attach a dummy bone to the town model and just locate it to where we want it. Next load the controller that comes with the effect. I’m using the English translated version and that really helps to know what you’re doing. The control is called WaterLightController_5.pmx. The controller has several functions. Only the ones in the top rows will be useful most of the time. The one’s on the bottom row just tweaks the color of the water and are only useful under special lighting conditions. There is a proper way to use the controller that you need to be aware of; the controller has a single bone which is used to tweak the base color of the water. The color value is controlled by the x,y,z coordinate value of this bone. It works on a scale of 0-255 and basically is an RGB system. You can set these values manually by inputting the numbers directly, but it is a lot easier to just move the bone around till you get the desired color. Once that is done, deselect this bone before messing with the morph sliders. The water effects only support ripples and not splashes as mentioned above, but this is still extremely useful. Basically, how it works is that any mesh that collides with the water surface will trigger the rippling effect. What this also means is that a MMD model boat will cause ripples so long as it is moving. Also, the same applies to a model wading in water. This latter, can make for some really interesting video possibilities. Can you capture the rippling effect in a still image? The answer to this question is: NOT DIRECTLY. The method is to make a short video clip of the scene. The model must have moved at some point in that clip. Then extract the image using a video editor. We are going to show you how to set up a scene like this (and amaze your friends). It’s actually ridiculously easy to do, but you do need to plan ahead. First of all we loaded a sky-dome. Then we loaded the water effect model and a scenery model and attached both to the same dummy bone. Then we loaded the IA model. The dummy bone was then used to move both the scenery and the water so that IA’s feet are located on the bed of the stream. Then, in this case, we loaded a motion to IA. BTW, we’re using the calm water version of the effect. This was sized to 200% larger than it’s load size as recommended in the documentation. Next, using exactly the same method as with the puddle above, using the controller we configured the behavior and the coloring of the water. Unlike with the puddle, we actually did use the bottom sliders to tweak the green values a little for a more natural look. With our mountain stream water, it is relatively clear. It reflects a little of the blues and greens from its surroundings to give it a fresh, clean look. 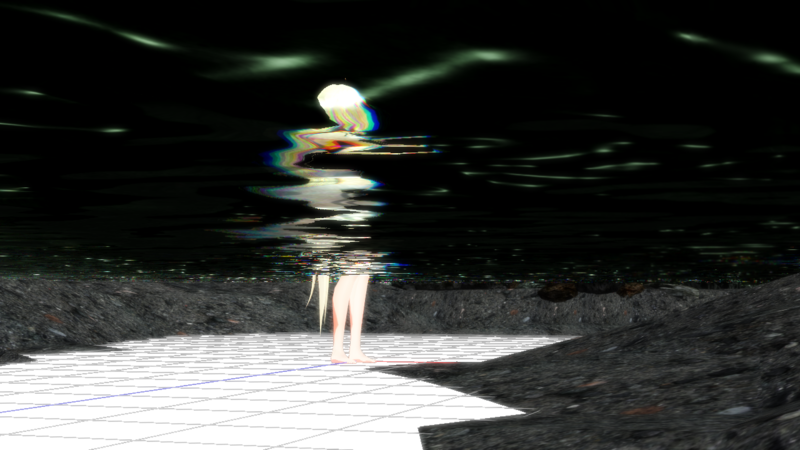 You can see IA both reflected on the water surface as well as those parts of her under the water. Once again the model draw order is crucial for the right look. Read this article if you have no idea how draw order works in MMD. GET THEM INTO THE WATER!! The effect’s colors behaves like real water – it has no color by default. Colors are determined by what is filling the environment. Also, like real water, the effect factors in transparency and reflective qualities. The water effect is purely an illusion. The water model itself is constantly flat. This is also why ripples are possible and not splashes. To trigger the ripple effect, another model must collide and move while in contact with the water model. Tinting the water with the sliders can be used for special lighting effects, such as what was done with the water in the IA, mountain stream example. Adding a slight green tint really helps blend the water into the scene. The water puddle in the Miku example did not need tinting. Just increasing the fog depth helped to create the illusion of wetness by reducing the intensity of some of the reflected light. Although the second video did use some shots of IA viewed with the camera positioned under the water, don’t make a habit of doing something like this as it’s actually wrong. The model draw order for viewing models above water is not the same as the model draw order for viewing models looking upwards from under the water. IA © The 1st Place Co.